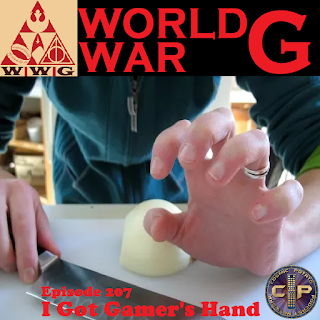 Cosmic Potato: World War G #207: I Got Gamer's Hand! World War G #207: I Got Gamer's Hand! TASTE TEST Special Valentine's Day Oreos--17 bizarre work related ailments including baker's knee, fiddler's neck and cobbler's femur--World War Z 2 has been cancelled--Darth Vader is being turned into an anti-hero--New emojis are here and they include a woman in a wheel chair, a robotic arm, and a drop of blood--Universal Studios has a Troll character that is naked and farts glitter--A zoo in Texas will let you name a cockroach after an ex then watch as it's eaten by a meerkat--Liam Neeson accused of being a racist--Robert Pattinson being eyed as DC's next Batman--Our 3 favorite superhero movies that are NOT in the MCU--Redbox review of The Sisters Brothers.